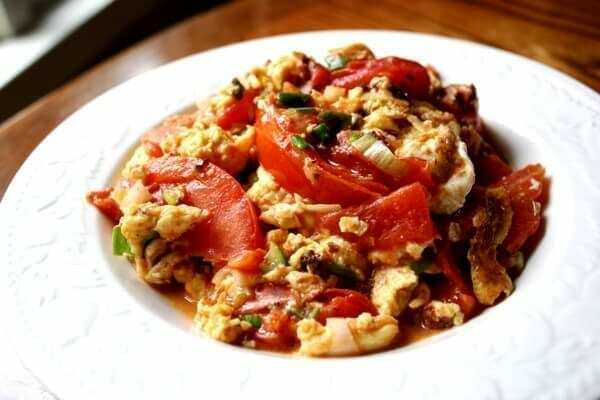 This quick and easy Chinese stir fried tomato and egg dish is something that you’ll find on a lot of Chinese home dinner tables. It’s fast, easy, and cheap, and every family has its own version. Start by cutting your tomatoes into wedges and chopping your scallions. Then crack your eggs into a bowl and season with salt, pepper, sesame oil, and wine. Beat the eggs, and heat up a couple glugs of oil in a pan. Scramble the eggs and set aside. Add a little more oil to the pan and add the tomatoes along with a couple pinches of sugar. Stir fry until they begin to soften. Add the eggs back into the pan along with the chopped scallions and stir-fry for another minute. Check for salt, and add a little more if necessary. Serve!